got a parking ticket at a hospital car park. The ticket apparently (I've not seen it yet) doesn't state a reason for issue. spoken to a colleague who's given a number to call for a contact at the hospital / parking company (presuming it's private) who's said the issue is that was blocking some stairs. 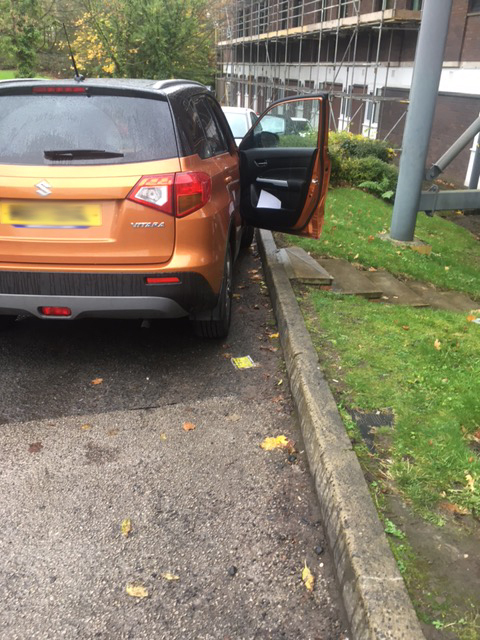 As you can see there are no markings to show that you shouldn't be parked there, there isn't a dropped kerb, the stairs go down to a shed. Issued for "causing an obstruction"
Depends entirely on the signs. Signs signs signs. No signs that the wife could see. What signage would be the sticking point here? "park in marked bay" or "keep access clear" kind of signs? We need to see what any signs say that could reasonable be seen from there. That's it. Hide the drivers identity please. You've presumably read enough threads by now to know NOT to tell the entire world who drove the car. Have updated the original post with the company that issued the ticket and the reason "causing an obstruction"
not got photos to show any or lack of signage, will try and get. If disputed and rejected have I passed up the opportunity to pay the reduced rate if paid within 14 days? Send the MSE FORUM TEMPLATE APPEAL, in blue, from the MSE parking forum newbies thread. Do not use the website appeals, that's awful. Google using MSE newbies thread. Takes you ight there. Read read read the instructions in post one. CEL NEVER get keeper liability right, they usually cancel on appeal but if not you get POPLA to cancel. Yes, but wait till day 26, as the NEWBIES thread on MSE explains and it tells you why to delay, as this is a windscreen PCN. Saves us typing, if you just read that! A cinch to win as long as the driver is never admitted. A colleague has had a similar ticket (not sure if obstruction or not) cancelled by talking to someone who works at the site (not sure if parking company or hospital staff) who's managed to get a number of tickets cancelled so going to try that, if not then I'll go down the route described above. won't be talking to the parking company other than to submit an appeal. I take it from a quick google that I'm waiting for the NTK (or lack of) before starting the appeal process? No, read the advice already given, wait until day 26 and appeal as keeper, they will then not send out a valid NTK on day 28 but use the contact details from the appeal instead of using the DVLA. This will be a POFA 2012 fail to add to the others.